Follow the signs for Rhosybol across the fields and between wind turbines standing idly by. 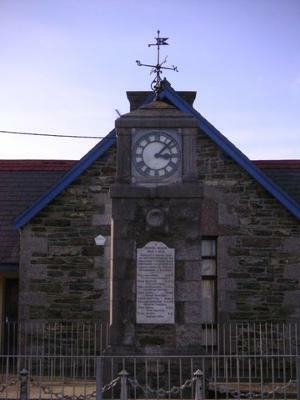 The Rhosybol clock memorial stands in front of the village school. Eight brave Anglesey men who gave their lives as sacrifices for their country, justice and freedom are listed under the clock. How much notice have the generations of children playing behind the tower given to the grief in this handful of names? Should they be told the stories of the heroic deeds of their great-grand parents or should the memories tick away down the long village street and be laid to rest in the mist of time? are fading now with the ticking of time. the prescribed years curing the aching souls. Time ran out for the men and boys a hundred years ago. Time stopped in a blinding down of gears. Time ceased to be anything but an agony hanging heavy. Time suspended in no-man's land. and savour in one last kiss. No time to hold close the future. Slowly out of time with the rest of the world.